When those chromosomes are passed along to offspring, they're not always passed along whole. Instead, a process called recombination "scrambles" the chromosomes. That's not exactly how it works, so let me give an example. As I mentioned, lots of organisms have (at least) two copies of every chromosome. When they get ready to reproduce (producing sperm or eggs), the chromosomes line up next to their alter egos. So chromosome one lines up next to the other chromosome one, and they swap equivalent parts. So you end up with two copies of chromosome one, but they're not the same as they were before because they swapped parts. That's recombination. Here's a diagram from famed geneticist T.H. 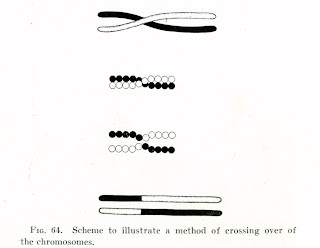 Morgan (via Wikipedia) to help you understand the process (the chromosomes are the white and black lines). What's the value of recombination? It frees us from Muller's ratchet! Muller's ratchet is all about slightly damaging mutations. Let's say that an organism experiences a really bad mutation and passes it along to its offspring. But the mutation is so bad, the offspring can't survive, so the population to which it belongs isn't really harmed because that really bad mutation is eliminated when the offspring die. It's unlikely that any other organisms will get receive that mutation. But what happens if there are only slightly damaging mtuations? Say a mutation that makes a gazelle run a little slower or makes a plant grow smaller leaves. It's not bad enough to kill them outright, but it gives them a kind of disadvantage compared to other members of the same species. The gazelle's going to get eaten sooner than it's faster cousins, and the plant won't get as much sunlight as it's larger-leaved relatives. All by themselves, slightly damaging mutations don't do much, but when they start building up over multiple generations (and multiple mutations), that's when things start getting bad. Imagine a slow gazelle that also has gaudy coloration, bad eyesight, brittle bones, and weak teeth. By themselves, those mutations are inconvenient, but all those mutations together in one gazelle makes for easy prey. The inevitable breakdown of the health of a population due to the accumulation of slightly damaging mutations is called Muller's ratchet. Eventually, it leads to extinction. Recombination gets us out of Muller's ratchet. Recombination allows for the swapping of parts between chromosomes. Sometimes that leads to chromosomes with extra slightly damaged genes, but other times it can generate chromosomes with fewer slightly damaged genes. Recombination gives us a way of getting rid of slightly damaged genes without killing anyone. See how handy that is? That's all well and good, but what about organisms that self-fertilize, like many different plant species? Under those conditions the Muller's ratchet problem should be magnified by inbreeding. Recombination can get you out of Muller's ratchet in a large population, but in a small population where mate choices are few, organisms end up having offspring with a close relative, and the odds of getting two broken copies of the same really important gene goes up. It's a little different than Muller's Ratchet, but the outcome should be similar: As the generations progress, inbred populations experience a loss of genetic health due to the buildup of bad mutations and higher likelihood that both copies of an organism's genes will be broken. That's called inbreeding depression. As I said, though, there are flowers that self-fertilize. Each self-fertilizing flower is set up to mate only with itself, so there's almost never any outbreeding. How do these species avoid going extinct due to inbreeding depression? That's a great question, and the answer isn't exactly obvious. That finally brings us to an extremely interesting paper in this week's PNAS by Yang et al. This research group surveyed the genomes of 40 Arabidopsis plants and their parents, looking for evidence of recombination events. (Arabidopsis is mostly self-fertilizing.) They found some of the normal recombination events that swap parts of chromosomes, but they found many more examples of a type of recombination called gene conversion. In gene conversion, any one of multiple copies of a gene can be used to rewrite the code of a gene. If you think of regular recombination as a a fair swap of one chromosome part for an equivalent part, gene conversion is more like a replacement of one gene with part of another. The part that's replaced (if it hasn't already been copied somewhere else in the genome) is lost. Gene conversion would be a marvelous way of removing any sort of bad genes from a population, even if it was heavily inbred, like the self-fertilizing Arabidopsis flower. Sure enough, Yang et al. found that gene conversion constituted "90% (probably nearer 99%)" of their detected recombination events. Not only that, but gene conversion changed genetic sequences (protein sequences) 600 times faster than spontaneous mutation. As a creationist, what gets me really excited is not only the speed of mutation but the specificity that can be generated by gene conversion. These aren't just your average spontaneous mutation, which could be good or could be bad. Gene conversion draws on genetic copies already present in the genome. It's a far more efficient and specific means of changing genes without the inherent dangers of random sequence alterations. It reminds me of Lightner's work trying to demonstrate directed mutations. Maybe these aren't directed mutations at all. Maybe she's found evidence of gene conversion. Somebody ought to look into that. It's very exciting. Yang et al. 2012. Great majority of recombination events in Arabidopsis are gene conversion events. PNAS 109:20992-20997.